WHY SAVE AND SOW YOUR OWN SEED? WHAT I HAVE FOUND OUT ABOUT PURCHASED SEEDLINGS? Unless they are from a local supplier committed to organics – they invariably fail. Seedlings/seeds bought from the hardware store/supermarket usually come from an climatic area totally inappropriate to yours and will struggle and ultimately fail. If you are into conspiracy theories – this is fact not supposition ! The large agchem companies would love to have patent rights on ALL THE SEEDS in the world – then they can muck around with them – alter their DNA to make them resistant to herbicides/pesticides (for starters!) and render the seeds sterile so they cannot be saved from one generation to the next. THIS IS ALREADY HAPPENING ON A GLOBAL SCALE. By saving your own seed you are being a voice for the farmers of the world and those who just wants to feed their family healthy food. Resist. Save your own seed. GIVE PEAS A CHANCE! 1. Wet Fruit – like Tomatoes, Cucumber, Zucchini, Eggplant. Leave a healthy, disease free ‘fruit’ to reach maturity on the plant. i.e. let it get old and large. 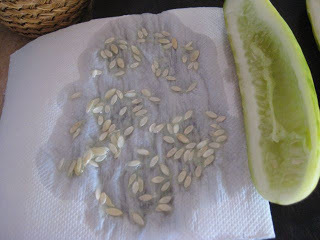 Split in half and scrape out the seeds onto double sheets of kitchen paper. 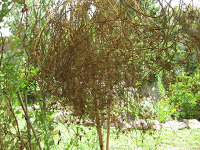 Leave the seeds to dry in a cool, dry place until all moisture has gone. Store seed in airtight, cool, dry place until ready for next season’s sowing. Label! TOP TIP: When you want to sow the tomato seeds you simply lay out the seed-studded kitchen paper on top of the soil, cover it in a bit of fine soil and keep watered. The seeds germinate as the kitchen paper decomposes. Divide up the seedlings and plant where needed. 2. Dry Fruit and Seeds. Carrot, Parsley, Cabbage family, Coriander, Lettuce, Beans etc. These are often really tiny seed cases and even tinier seed so patience is required – and small pairs of hands! 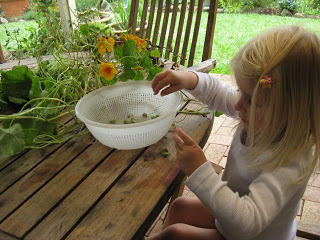 Follow steps for ‘wet seed’ – collect seeds from mature and disease free plants. Make sure seeds are completely dry before you harvest them. You can do this is the ‘age old way’ by hanging them upside down in a airy place. 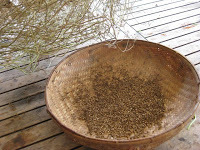 Here I am drying coriander seed which is then used to replant next season and stored for my spice cupboard. 1. Make sure your seed sowing mix is fine and free draining. If the mix is too ‘lumpy’ there will be too many air spaces – the seeds do not fit snuggly and germination rate will be poor. I usually make my own by sieving some garden soil and compost then adding it to washed river sand (about a third of each). Finally a couple of handfuls of vermiculite of perlite (the shiny or white stuff you see in commercial mixes – a huge bag costs about $20 and lasts for years). 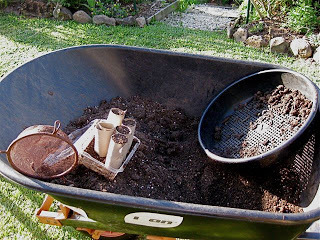 This gives bulk to the mix without adding weight and also holds water.FACT: Commercial potting mixes are often quite acid and contain a lot of undesirable material, some you can see – like lumps of wood and foundry waste – and some you can’t. As the source of the material in the mix is unknown I worry about potential contaminants and the sustainability of the product (i.e. where did they get the soil from?). These concerns are compounded by the fact that it has probably travelled interstate to your supplier in a very large, non biodegradable, plastic bag. 2. To plant directly in the soil or in a container first? This another one of those questions I am always asked so lets try and clear up any confusion. In the soil – large seeds and root vegetables. Peas, beans, corn, carrots, parsnip etc. In containers first – everything else (fine seed). Lettuce, annual herbs (basil, dill, coriander etc), onion tribe, cabbage family etc. 3. What kind of seed raising container? EVERY TIME YOU DISTURB THE ROOTS OF A SEEDLING YOU SET-BACK IT’S GROWTH. 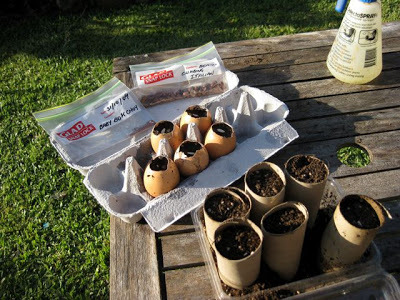 So it makes sense to grow seedlings in individual containers that are biodegradable like toilet paper rolls, egg shells, newspaper pots (simply dampen the paper and form it around the shape you want and leave to dry. The egg container. Recently, when I was traveling in Malaysia, I saw this wonderful idea in a ‘green supplement’ of the Straits Times. Brilliant in it’s simplicity. You simply knock off the top of the shell with a knife when you want to use a fresh egg, punch a small hole in the bottom with a wooden skewer and use the egg carton as the seedling holder. 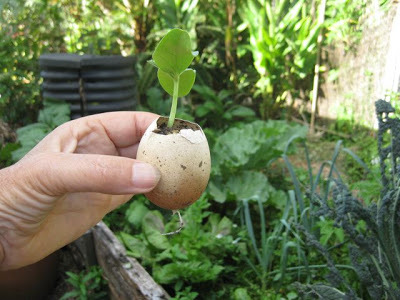 When it’s time for planting you just crush the shell a little in your hand and PLANT THE WHOLE THING – the calcium from the egg shell also help s to feed the plant as it grows. Note in the picture above of a cucumber seedling how healthy it looks and the roots already bursting out of the hole in the bottom. Obviously this is impractical with very fine seed and I use conventional seed trays or punnets for initial sowing them plant them out later into individual containers. 4. Caring for seedlings. Start seeds off in warm shady place. As the shoots emerge gradually move them into more light. KEEP THEM REGULARLY WATERED with a fine mist – I use a spray bottle and keep it next to my seedlings. This process of moving them into increasing light is called ‘hardening off’. If you don’t – the seedlings become long and leggy and won’t transplant well into the garden. Plants suffer from stress too!! It’s also important to water-in all seedlings with a solution of seaweed extract and water (I use COMPOST TEA – see previous post) Seaweed contains significantly higher levels of vitamin B1, and that helps plants overcome transplant shock and also results in a much earlier yielding plant. 5. When to plant out your seedlings. 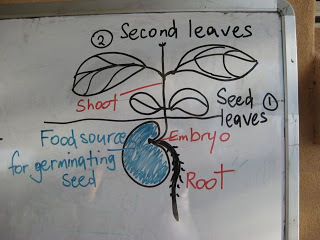 WHEN THE SEEDLING HAS GROWN IT’S SECOND SET OF LEAVES (see above diagram).